"Does anyone have any knowledge of there being a farm at Moredun Mill in the 1920s? There is a family 'memory' that a great uncle farmed there, as a tenant farmer, I guess during the 1920s or 1930s. His name was John (Jack?) Blain. There seemed to be some change of use in 1934/35, if indeed Moredun Mill ever was a farm. Family legend can grow arms and legs!" "We've tried to look at the Valuation Rolls at Edinburgh Central LIbrary but, alas, that period was mysteriously missing from their index books." "I'm not sure if this helps with the answer to the question about Moredun Mill (Farm). 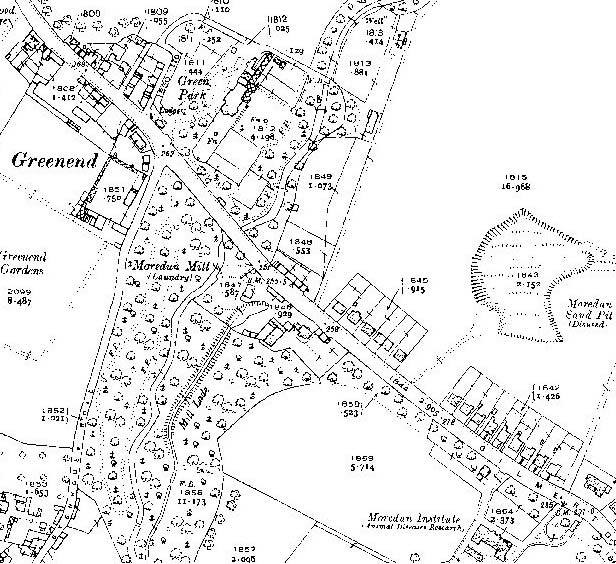 Here are a couple of map extracts showing the Moredun Mill at Greenend. - The 1914 map shows 'Moredun Mill (corn). - The 1930 map shows 'Moredun Mill (laundry)." I've reproduced Neil's two map extracts below because they may contain further clues that somebody will pick up on. 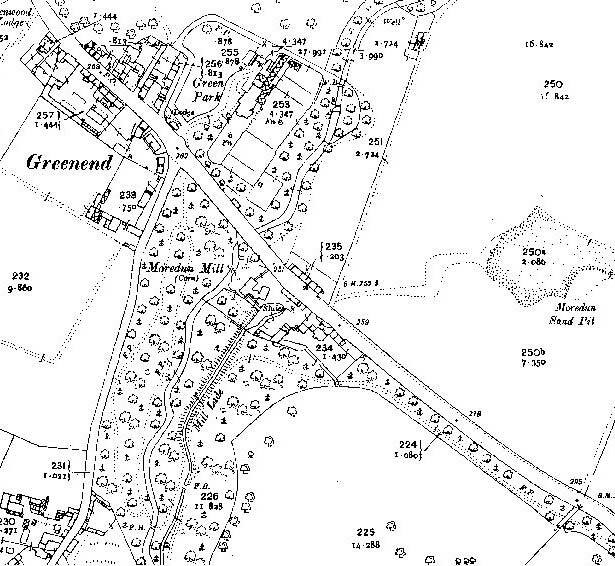 NOTE: Greenend, shown in both these maps, is the junction of Gilmerton Road (running from top-left to bottom-right, across the map) and Stenhouse Road. Robin's Nest Inn is on the north side of Gilmerton Road at Greenend. Thank you to Neil Lawrence for replying to the question about Moredun Mill. "There was a mill on the Gilmerton Road approx opposite the boundary of Craigmillar Golf Club. It was next to the Research Park and Murray Home, about 100 yds up. It could have been the original farm where there are now houses and Morrisons. In the early 1950s, the mill was bought by Carr's, the footwear makers, as a factory. It now has something to do with Government research. Opposite the mill, there was a laundry run by White's of Liberton. They ran it until, I think, the early 1960s." "Further to the enquiries (in 'Recollections 1' above) on Moredun Mill having a farm, I believe I may be able to help a little. From what I can ascertain, the first housing estate in Moredun appeared around the 1940s, probably prefab houses. The 1955 Post Office Plan certainly shows housing there. The present housing estate, where I live, was built in the 1960s to replace prefab housing. There was certainly older activity in the area than housing. I know this from digging in my garden and finding the remnants of clay pipes." "I have found no record of any housing in the area before the prefabs. However, back from the present Moredunvale Road, there was the original road upon which two cottages stood. One of which survives to this day. The other was badly vandalised in the 1970s and had to be demolished. It is only a guess but I would venture these could have been farm cottages." "As to the laundry, Whites of Liberton operated near the top of Moredunvale Road, where the present nursing home stands today, from 1951 until the early 1990s. The company was wound up in 1996." "Where Morrisons supermarket stands today was the Animal Diseases Research Centre, the Moredun Institute. This was founded in 1920 by some forward-thinking farmers who were worried about the possible impact of new intensive farming methods upon livestock and was committed to the scientific research into the treatment of animal diseases. In the late-1990s the Moredun Institute moved out to the Edinburgh Science Park near Bush, Midlothian, where they employ over 200 scientists, vets and support staff dedicated to animal welfare." Thank you to Shirley Taylor (née Laing) for posting the following message in the EdinPhoto guestbook. "I've been reading the entries on the EdinPhoto web site about Gilmerton. I lived in Moredun Park Terrace from birth in 1956. I've been looking for pictures of the prefab houses that I was raised in, before moving on to the new Moredun houses when they were built. We were one of the last families to move from our prefab.  I came across your site, what a walk down memory lane I have just had. I was trying to track when our prefabs in Moredun Park Terrace were finally demolished, and have spent the last few hours, instead, reading through all the comments." "I went to the original Moredun Primary School, and would love it if I could find a picture of it, or people who attended when I did, 1961 to 1968. I then I went on to Liberton High School. I'd love to hear about Moredun from anybody. Thank you"
or if you would just like to send a reply to Shirley, please email me, then I'll pass on Shirley's email address to you." Thank you to Gordon McLetchie for writing in response to Shirley Taylor's request in her Recollections 4 above. "I was browsing through the EdinPhoto website and came upon Recollections 4 above from Shirley Taylor (nee Laing) sent on 23 November 2012 regarding the prefabs in Moredun Park Terrace, requesting any photos of her prefab and of Moredun Primary School. I lived in the prefab directly behind hers (in Moredun Park Avenue) and have several photos of her house and views onto Moredun Park Terrace taken just prior to the first demolitions in 1965." "Here is an aerial photo of Moredun school and the surrounding prefabs for your website which may be of interest to others. The photo was taken around 1952 when the school had just opened.  I don’t know if there is any copyright on this phgoto. It was given to me many years ago by my late Uncle who was at the time Headmaster of Sciennes primary school and had applied to become the first headmaster at Moredun primary. He had been in the RAF during the war so maybe still have had some contacts in the flying fraternity!" I've passed on the 3-year-old email address that I have for Shirley to Gordon. I hope that she is still using the same email address now, and that Gordon will be able to contact her. I'll check to see if RCAHMS hold the copyright on this photo. If they don't, I don't know of any way to discover who might have taken the photo and/or who might hold the copyright for it.  If you have any suggestions of leads that I might follow, please email me then I'll follow them up. Thank you. Thank you to Tom McLuskey for posting this reply below Shirley's message (see Recollections 4 above) in the EdinPhoto Guestbook. "Shirley: You may not know me but my parents, along with my brothers and sisters, moved to Moredun Park View - that is the street looking onto the park and the primary school. My brother, David, sisters Ray and Janice McLuskey, as well as the Reid kids all went to both these schools* around the same time as you so maybe you would know them. Tam McLuskey, Shannon Lake, Westbank, British Columbia, Canada. Tam posted his email address and a reply to Shirley Taylor's message above in the EdinPhoto Guestbook on Nov 24, 2012. "Moredun Mill was originally the retail part of Aikman Boot and Shoe wholesalers, with their warehouse and offices in Jeffery Street overlooking the Waverley Station. This building was destroyed by fire on 10 November 1955, the same night that C and A Modes was also burnt down on Princes Street." "Moredun Mill was bought by CW Carr Limited in 1956. CW Carr Ltd did not manufacture shoes; they were all made in various factories in England. Moredun Mill was used as an office and warehouse distribution centre for their shops. They had about 70 shops across Central Scotland. I worked there during my school holidays between 1959 to 1961." "The company was taken over by Tandem Shoes and moved their headquarters to Bellshill. It think that this was in the mid- 1970s." "The Edinburgh Post Office Directory 1927-8, p47 lists two people called Blain at Moredun. Your original enquirer, Moira Fleming, in her 'Recollections 1 above was correct, after all. - Blain, William, dairyman, Greenend, Liberton"
"I've just found your web site and it brought back many memories for me. I was born and bred in Moredun Park Crescent and lived a prefab house there there from 1954 until the houses were demolished in 1966, when I was 12. 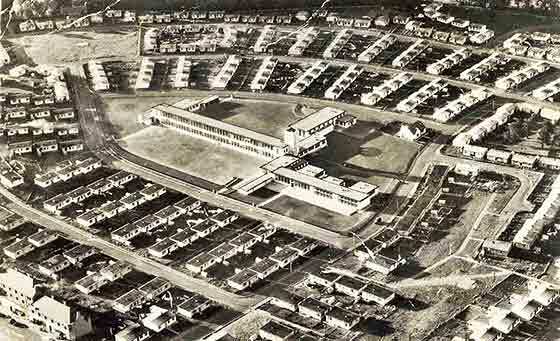 Over 4,000 prefab houses were built in Edinburgh in the late-1940s /early-1950s, including 565 at Moredun. These houses had an expected lifetime of fifteen years. Surprisingly, a few of those at Moredun are still standing and occupied today, 2016. Here is a photo of one of them that I took a few years ago. "We moved to the Inch but we're not happy there, and moved to Chester, England, in 1968. Sadly my youngest brother Ian passed away earlier this year. My dad had an ice cream van . My mum used to work at Whites the Cleaners when we were at primary school." "I have many happy memories of playing in the burn at Moredun with my two brothers Alan and Ian. I'd love to hear from anyone who lived there during that period." If you'd like to send a reply to Trish, please email me, then I'll pass on her email address to you.